Hurricane season runs from June 1st through November 30th. The National Hurricane Center usually issues a watch 36 hours before landfall and a warning 24 hours before landfall. 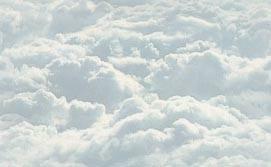 Hurricanes and tropical storms are unpredictable and all residents should pay very close attention to them as they develope. 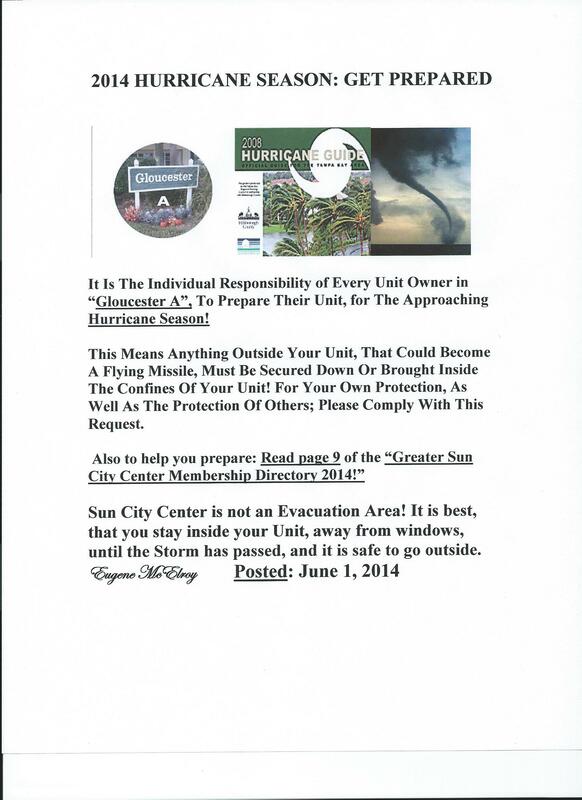 Sun City Center is not located in a mandatory hurricane evacuation zone. Residents are responsible for making their own emergency plans and preparations well in advance of any storm, including plans to evacuate should their homes be rendered unsafe in which to stay. 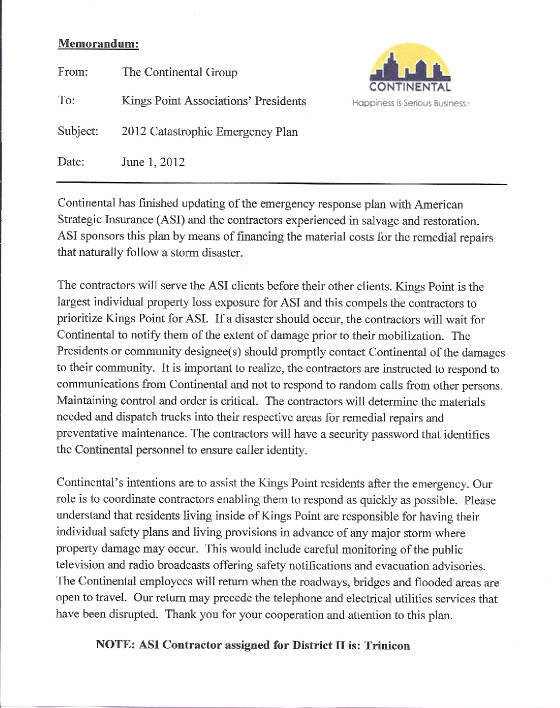 It is the intention of The Continental Group to assist the residents of Kings Point during an emergency. Our role is to coordinate vendors and contractors, enabling them to respond as quickly as possible in an emergency. Continental employees will mobilize as soon as it is safe, recognizing we might be stranded by bridge closings or flooding. Our employees live in areas that may be more affected by the storm and evacuation orders. We will be available as soon as it is possible. Telephone and utilities might be out of service. Residents must understand that Continental is only able to respond after the utilities have been restored. Continental has no control of restoring water, telephone or electric service. Contractors and vendors will not respond to roof leaks or other emergencies, such as fallen trees or blocked roads, until the storm has passed and they can safely travel to Kings Point. Currently, we manage 5,175 units in this community. The number of emergency repairs can easily exceed thousands, ranging from minor to serious. Continental and the vendors will work together to prioritize needed repairs. Serious repairs will be given priority and minor repairs will be expedited as quickly as possible. Purpose: Protect the lives and health of residents and the employees of Kings Point, and protect and minimize damage to residents' property in the event of an emergency. 1. To evacuate and account for all employees. 2. To assemble the company's Emergency Response Team for implementation of the response plan as soon as it is safe to do so. 3. Prevent further property damage through mobiling vendors to begin repairs and estimates as soon as it is safe to do so. 4. File any applicable reports with the Federation of Kings Point. 1. Assess the situation, number, and types of hazards expectedased on past experience. 2. Protect employees, residents, contractors, equipment, vital records and other assets. 3. Coordinate with the insurance company on any possible claims. 4. Get the business back up and running. The Hillsborough Emergency Operations Center (EOC) is in charge of any disaster countywide. After the storm, the Sun City Center Community Emergency Response Team (CERT) is the local operation center and coordinates all local activity by volunteer first responder groups (such as the Emergency Squad and SecurityPatrol) until such time that uniformed county responders become available. The Sun City Center and Kings Point amateur radio clubs will maintain communications between all local responder groups, the National Weather Service in Ruskin, Hillsborough County EOC and state authorities. After a storm, the Sun City Emergency Squad Public Information Officer (PIO) will man a local disaster desk at 813-633-1414 to receive and respond to all local and media information requests. Call the Hillsborough County Health Department. Call the Hillsborough County InfoLine. Call your home health care provider. When the life and property are in immediate jeoperty. SCC Community Resource Deputy Chris Girard. Kings Point Chief of Security Scott Dunlap.